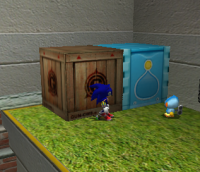 Chao container box (seen on right), as found in Sonic Adventure 2's City Escape. First Container: Chao Key necessary to visit the Chao Garden after the end of the stage. Second Container: One copy of all non-rare small animals found throughout the stage to take to the Chao Garden. Third Container: One copy of the stage's designated rare small animal (Legendary category). It should be noted that if a player dies before opening all three containers, they will only need to open containers they have not already opened to get the contents of the second and third containers; the Chao Key and small animals are both retained even after losing a life. Exiting the level will retain every animal collected, but the Chao Key will be lost. This page was last edited on 6 September 2017, at 18:02.